Carmynn Bonner delivers a pitch to Troy batter Ella Furlong with Tia Bass on second base. Sierra Caskey belts a single to right field against Troy. Layla Smith throws to first for an out in the top of the third inning. Megan Malott beats a throw to first baseman Caroline Stanaway by Northmont pitcher Carmynn Bonner to get an infield hit. 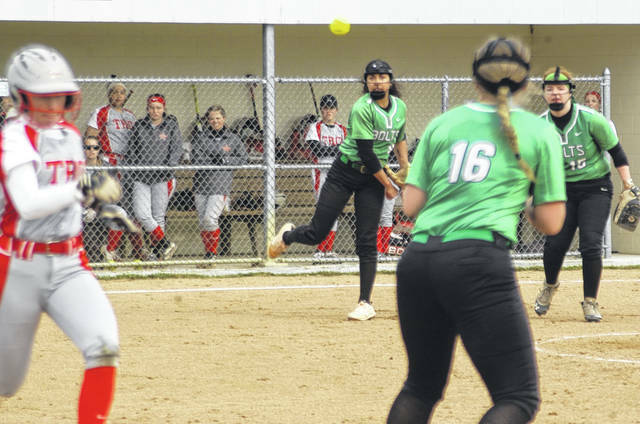 CLAYTON — A pair of 1st inning errors proved costly Thursday for the Troy softball team as Northmont managed to push a pair of runs across to take an early 2-0 lead. 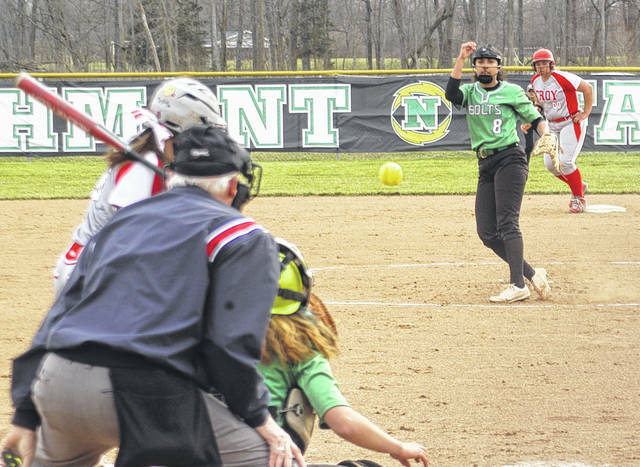 Those errors loomed even larger in the top of the 7th when the Lady Trojans scored three runs before Northmont stopped the bleeding to preserve an 8-7 victory. 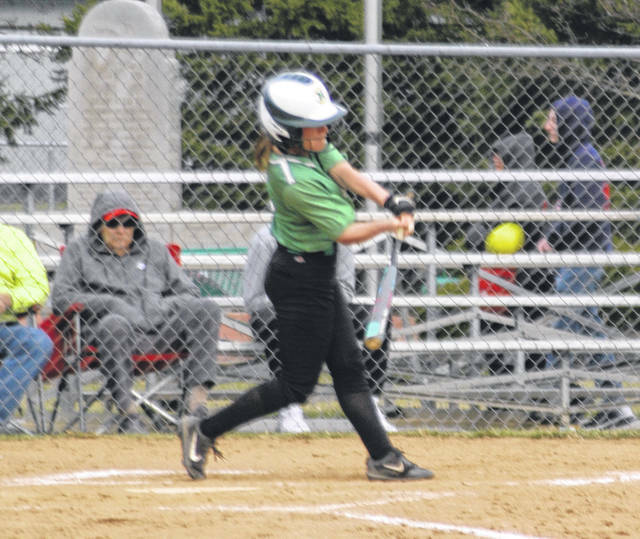 An infield error let Kyra Rottgen reach base and an outfield error put Kassie Keleman aboard and Sierra Caskey followed with a two RBI single to give the Lady Bolts an early advantage. Northmont increased its lead to 6-0 in the bottom of the 2nd inning on a pair of bunt singles, a walk and two singles to left field. 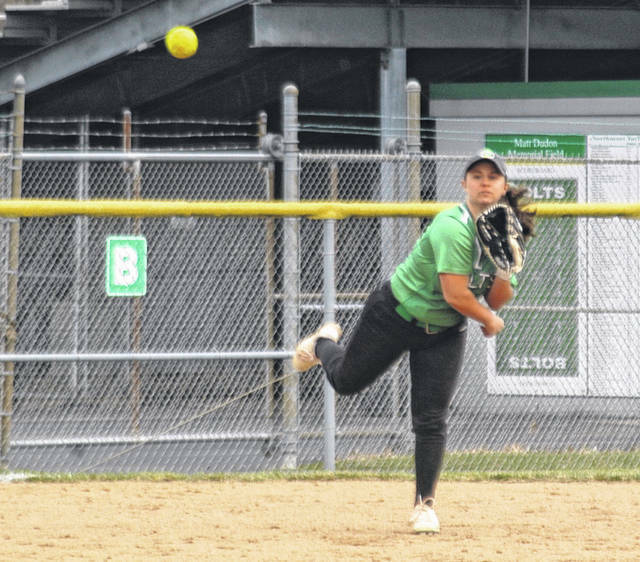 Northmont increased its lead t0 8-0 in the bottom of the 3rd on a walk by Maddie Gilvin and a two-out single to left by Carmynn Bonner, who advanced to second on the throw to third. Kyra Rottgen followed with an opposite field single down the left field line to score both runners. Troy cut that deficit in half in the top of the fifth. Lexi Piper led off with a single to right and scored on a two-out double to deep centerfield by Lauren Fonner. Fonner advanced to third on a wild pitch. Megan Malott reached first on a dropped third strike and advanced to second on a wild pitch. Josie Rohlfs singled to drive-in two runs and Paige Nadolny doubled off the top of the centerfield fence to score Rohlfs. The Lady Trojans nearly tied the game in the top of the 7th inning. Madelynn Lavender drew a leadoff walk and Fonner followed with a two-run homer over the right centerfield fence to cut Northmont’s lead to 8-6. After Bonner recorded back-to-back strikeouts Nadolny doubled to center with 10 coming in to pinch-run. A wild pitch and back-to-back fielding errors made it an 8-7 game, but Bonner struck out Piper to end the threat. Mangen noted that Troy is much better team than its record reflects.